Big flavours come in small packages. And this siew mai recipe proves that. 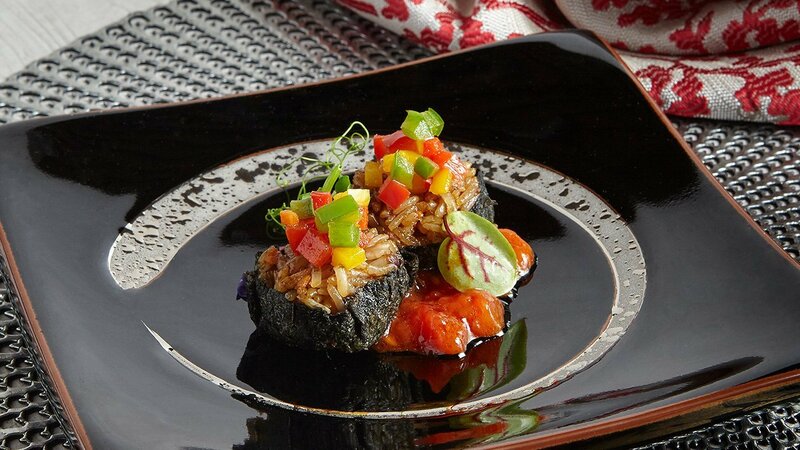 These seaweed-wrapped gems filled with juicy pork and crunchy vegetables will leave your diners’ taste buds crying out for more with every bite. Soak glutinous rice for 2 hours, strain dry. Steam for 30mins and set aside. In a mixing bowl, add glutinous rice, ingredients A. Mix well. Trim seaweed into 10cm diameter circles. Wrap 30g of fillings with seaweed to form a “siew mai”. Steam for 20mins till cooked. Bring seasonings A to a boil till it forms a thick sauce, use it to garnish serving plate. Heat up oil in a pan, stir fry ingredients B till well mixed. Lay the vegetables on the garnished plate and place steamed seaweed “siew mai” on top. Ready to serve.